SNLUG1.25BLACK Black medium (2-7/8") Each pack comes with 4 individual lug nuts with the StanceNation logo laser etched on each piece. Note: For a full set, please make sure 4 or 5 packs are purchased (depending on your car). SNLUG1.25BLUE Blue medium (2-7/8") Each pack comes with 4 individual lug nuts with the StanceNation logo laser etched on each piece. Note: For a full set, please make sure 4 or 5 packs are purchased (depending on your car). SNLUG1.25ORANGE Orange medium (2-7/8") Each pack comes with 4 individual lug nuts with the StanceNation logo laser etched on each piece. Note: For a full set, please make sure 4 or 5 packs are purchased (depending on your car). SNLUG1.25GREEN Green medium (2-7/8") Each pack comes with 4 individual lug nuts with the StanceNation logo laser etched on each piece. Note: For a full set, please make sure 4 or 5 packs are purchased (depending on your car). SNLUG1.25RED Red medium (2-7/8") Each pack comes with 4 individual lug nuts with the StanceNation logo laser etched on each piece. Note: For a full set, please make sure 4 or 5 packs are purchased (depending on your car). SNLUG1.25PINK PINK medium (2-7/8") Each pack comes with 4 individual lug nuts with the StanceNation logo laser etched on each piece. Note: For a full set, please make sure 4 or 5 packs are purchased (depending on your car). 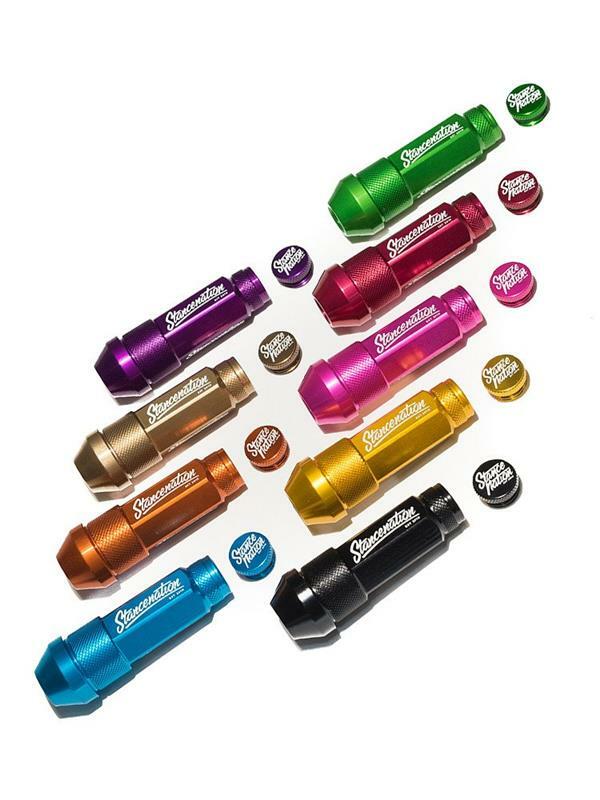 SNLUG1.25CHAMPAGNEGOLD Champagne Gold medium (2-7/8") Each pack comes with 4 individual lug nuts with the StanceNation logo laser etched on each piece. Note: For a full set, please make sure 4 or 5 packs are purchased (depending on your car). SNLUG1.25PURPLE Purple medium (2-7/8") Each pack comes with 4 individual lug nuts with the StanceNation logo laser etched on each piece. Note: For a full set, please make sure 4 or 5 packs are purchased (depending on your car). SNLUG1.25GOLD Gold medium (2-7/8") Each pack comes with 4 individual lug nuts with the StanceNation logo laser etched on each piece. Note: For a full set, please make sure 4 or 5 packs are purchased (depending on your car).